The UEFA Champions League semi-finals are here! 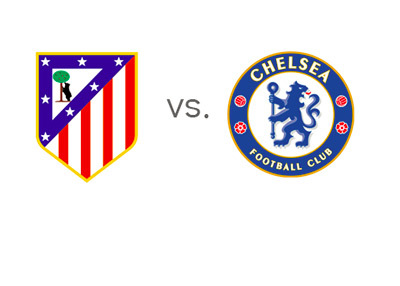 On Tuesday, April 22nd, 2014, Atletico host Chelsea FC in the first leg match at the Vicente Calderon Stadium in Madrid. This could be a good one! Atletico Madrid are racing towards the Spanish La Liga title, and can finish it all off if they win their next three league games. Then they head to Barcelona in the last round. The Spanish league offered Atletico to change the date of their last league game, vs. Elche, to give them the ability to rest for the Champions League. Diego Simeone refused. Atletico played and won 2-0. Diego Costa & Co. are in such great form, no point messing with the groove, is probably what the manager was thinking. Atletico eliminated Barcelona in the quarter-finals of the UEFA Champions League, 2-1 on aggregate. The Thibaut Courtois situation could likely be the hot topic over the next couple of days. One of the world's best goalies is on loan from Chelsea and there is an agreement between the two clubs that he wouldn't play if the two teams met. UEFA quickly said that Courtois can play and no such agreement is valid under the organization's roof. Diego Simeone was the last one to speak and he said that he will honour the agreement with Chelsea. There is also a sum mentioned that Atletico could pay to have the Belgian keeper play against his parent club. He definitely wants to. It will be interesting to see how all this plays out. Chelsea just had a nightmare match in the English Premier League. With four games to go in the season, they had the title in sight. If they won their next four, they would win the league. Last place Sunderland came to Stamford Bridge on the weekend and beat Chelsea at home 2-1. This was the first home EPL loss for Jose Mourinho's Chelsea in 70+ games. Now the league title is so far away. In the quarter finals of the Champions League, Chelsea eliminated Paris Saint-Germain in what was an exhilarating tie. Chelsea won on away goals in the last minutes of the second leg. That was something! Jose Mourinho rested a few players on the weekend: Petr Cech, David Luiz etc. It will be interesting to see how Chelsea respond on the big stage. According to the odds, Atletico are the favourites to win at home and the slight favourites to reach the final. The two teams played couple of years ago in the UEFA Super Cup, a game between the Champions League winners (Chelsea) and the UEFA Europa League winners (Atletico). Atletico, spearheaded by Falcao, demolished Chelsea 4-1. Thibaut Courtois was between the sticks for the Spanish side in that one. The teams will play again in London at Stamford Bridge, on Wednesday, April 30th, 2014.